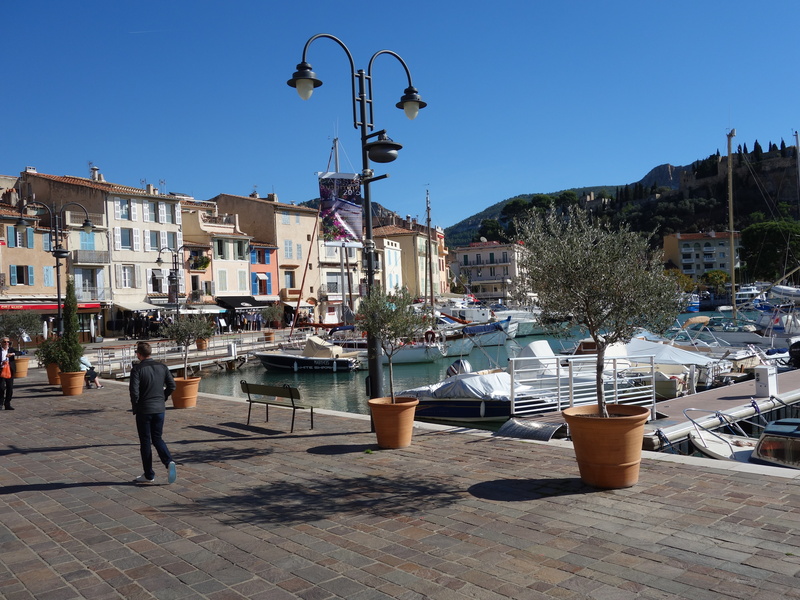 We took a great side trip to the old Mediterranean fishing town of Cassis, on the coast just southeast of Marseille. 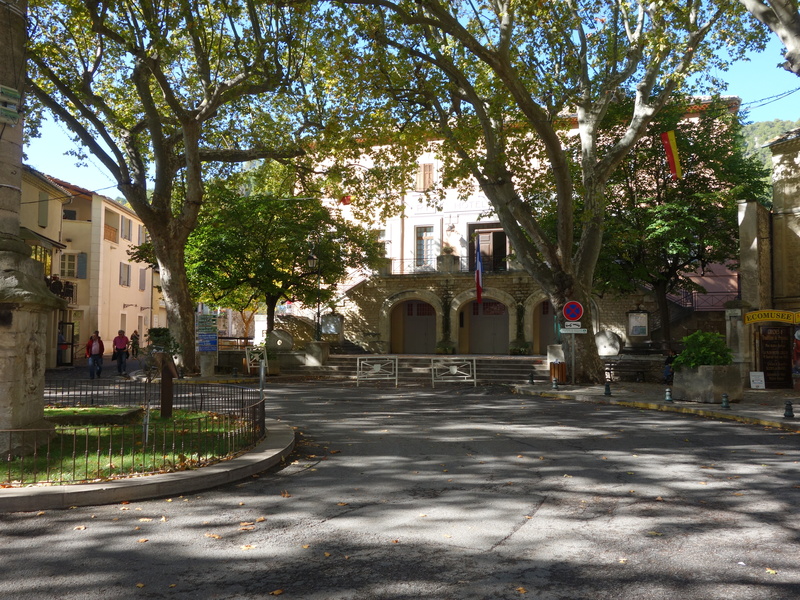 With Charlie driving, on freeways with a speed limit of 130 kmh, we made it in about an hour and a half and met our friends, Tom and Margaret Mesaros, who have been staying nearby in Aix en Provence. The Mesaroses are hardy travelers and are on a three-week trip that included the beaches in Normandy and an auto trip down through France to Provence. We also joined them for a walking tour of Avignon a couple of days ago. The calanques rise dramatically out of the sea. on the waterfront from the fishermen, who cleaned the fish while they waited – the attraction now is boat rides along the coast to see the amazing limestone cliffs (calanques) rising abruptly out of the sea. We went on a 90-minute tour that went into about eight of the calanques, two of them with little villages of their own. Then, after lunch at one of the many seafood restaurants that line the harbor, Pat and Charlie, and Tom and Margaret took a hike along the cliffs. I was a little sleepy after a lunch that included some of the rose’ grown nearby, so I stayed back and napped and then listened to NPR podcasts about what was then the third and thankfully last debate between the two presidential candidates. 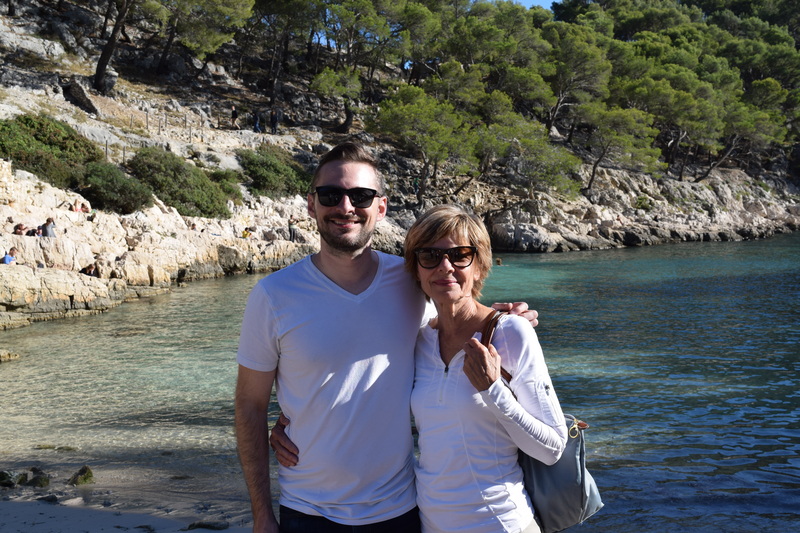 Pat and Charlie hiked down from the calanques to the beach. 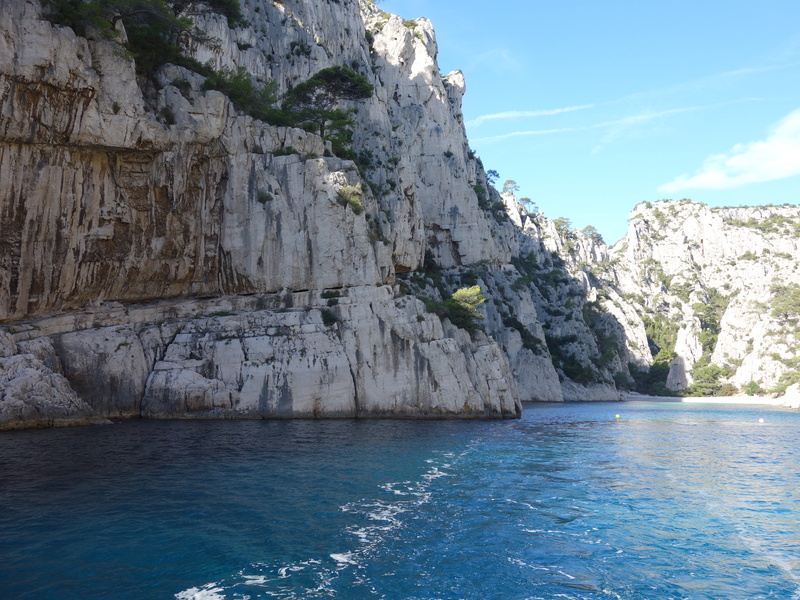 After taking the boat tour, hiking through the calanques and climbing the steep limestone cliffs afforded us a spectacular view from high above the crystal blue water. There were many different routes depending on your skill level and willingness to climb, and if you were really daring you could climb down the cliffs on narrow paths to the water, but the tourist office did strongly recommend hiking equipment. Nevertheless we stayed on the main paths and did fine. The length of the hike depends on how many Calanques you want to see, each requires climbing a steep rocky path and then scrambling down the other side to the next inlet, and the quality of the views and the amount of solitude both improve the farther you go. We made it to the second inlet, which featured a small beach, and people swimming even in the relatively cool October sun, and we heard that the third calanque was truly scenic, but we were a bit pressed for time. Vaucluse. It is only 6 km from where we are staying. 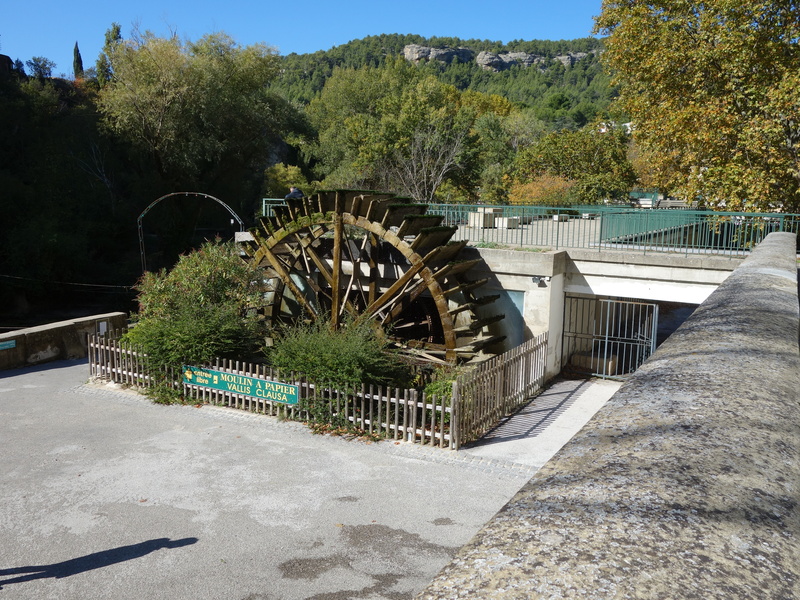 The source of the Sorgue River begins here, and the town was once important for paper-making, again using water wheels as the source of industry. It also is where the pet Petrarch mourned the loss of his lover, Laura. Our Edmonds neighbor and travel expert Rick Steves, in his guide to Provence, said Fontaine-de-Vaucluse can be overrun with tourists in the summer and may be the most overrated tourist site in France when the spring is not flowing. We had a nice hike and enjoyed the beautiful setting, but we were close by. It is probably not worth a trip out of your way to get here. Water wheel at an old paper mill. We are getting to the end of our trip. We take Charlie to the train today, and we head out on Saturday. We hope to do one more blog after that with some other thoughts about France.